Our complete guide to getting started with the Mage class in Realm Royale. Our Realm Royale Mage guide covers abilities, best builds, the Stone Spear Legendary Weapon and features strategy tips throughout! Realm Royale has only just gone into Alpha but it's already tearing up the Twitch charts and proving itself a worthy contender in the ongoing battle to be top-dog in the Battle Royale wars. Although there's a lot you'll be familiar with from playing games like Fortnite and PUBG, there are a few differences that help it stand out. Most notable of those differences is the class-based system it offers. There are Warriors who soak up damage for their teammates, sneaky Assassins, trap-laying Hunters, turret-building engineers and -last but by no means least - Mages. In our Realm Royale Mage guide we've got a breakdown of every ability this class has to play around with, as well as details of the Mage's Legendary weapon. Throughout you'll find lots of tips, tricks and strategy advice for improving your play with this character, and we'll be updating this guide a great deal over time. We're busy making in-depth guides to all of Realm Royale's classes. When you're done here, make sure you check 'em out! The Mage's Passive Ability provides an extra 30% potion effectiveness at all times. You don't need to activate anything to gain this effect, just enjoy a better effect whenever you quaff a potion. Health and Armour potions all restore 400 base points of their respective attribute when activated, which means that Mage's will actually get to enjoy 520 points instead. Soar is the Mage's mobility ability, and it allows the class to reach some seriously sneaky places. Use it to give yourself a favourable position on the battlefield, where you can get a better shot at the enemy while they struggle to return fire. This explosive potion will cause enemy players caught in its area of effect to be slowed. This leaves them particularly prone to your offensive Fireballs, perhaps followed up with a powerful shot or two from your primary weapon. You couldn't call yourself a Mage without a Fireball to chuck around the place! Note that once the Fireball has hit one player it will actually pass through them and continue to damage enemy targets behind them. The better the upgrade you can get, the more damage this ability will do. Ice Block is the Mage's core defensive ability and once activated you'll be encased in a block of ice that grants you immunity to all damage for three seconds. Not only that but you'll also gain a self-heal effect which should leave you better equipped to cope with the situation when Ice Block breaks. Remember that you can actually break this early yourself by tapping the ability button once again. This ability throws a wall out into the battlefield which you can use either as a defensive mechanism, or as a means of cutting off enemy targets from their teammates, so you can whittle down the opposition piece by piece. 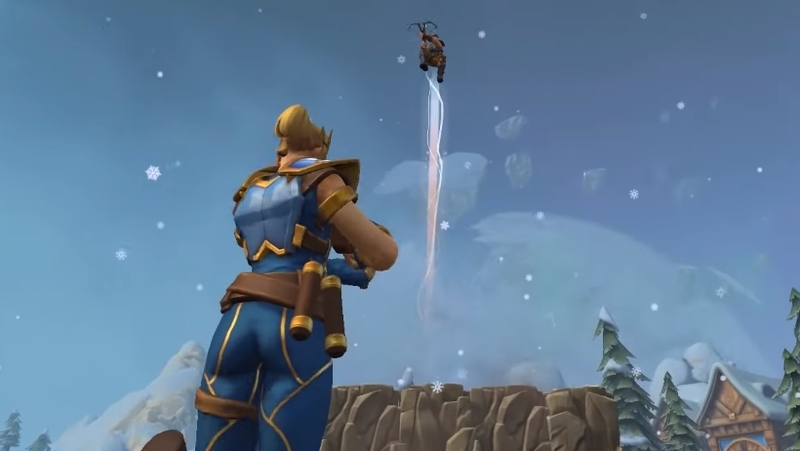 There are two schools of thought from the community when it comes to the Mage build you want to work towards in Realm Royale. The first plays things a little bit safer, while the second will work well for those of you who want to go full aggro! Ice Block / Fireball: If you want to be able to dish out plenty of damage while also having some emergency immunity/self-heal, this is the build you want to go for. Just keep in mind that when Ice Block wears off you're going to be a prime target for the enemy, unless your other teammates can keep them distracted and under pressure. Fireball / Explosive Flask: Combine these abilities together and you'll be able to slow the opponents down using the flask before letting rip with Fireball. As long as they're slowed, you're also capable of safely dishing out some damage using your primary weapon. Not so much of a build as a gameplay suggestion, but some players are finding huge success by packing a shottie as a Mage. The idea is that you whittle the opponent down from afar with your Fireball, then finish them fast with a shotgun to the face. Here's a handful of tips to getting more out of the Mage playstyle. It's very early days for the game and so you should expect this section to be expanded upon a great deal over time! - All classes have at least some kind of movement enhancing ability - provided by default when you start each match - and the Mage's Soar ability is great for escaping or setting up position for an offensive assault. Be aware of your environment at all times, and think about how you can use Soar to frustrate the enemy player and gain an extra advantage for yourself. Only practise will teach you the limitations of this move, so get out there and keep trying! - When you first arrive on the map your priority is to get a weapon you're comfortable with, but more than any other class the Mage depends on its abilities to survive. Grab every upgrade that you can in order to reduce your cooldowns and increase your damage potential. The longer matches go on, the more quickly you need to be able to obliterate your opponent. - As good a defensive item as Ice Block is, it's important to remember that when it breaks you're going to be very vulnerable to the other team's attention. Unless they're very good at ticking off a mental timer though, you have the advantage in knowing exactly when it's going to pop. When it does, move quickly - perhaps using Soar - in an unlikely direction to throw them off the scent. Don't forget that you can break Ice Block early by pressing the button once again - this can be great for confusing the enemy. The Mage's Legendary Weapon is called Stone Spear and it allows you to fire off a series of shots at an enemy that deliver 270 points of damage each time. This is not a particularly easy weapon to wield, and so you're going to have to practise a fair bit if you want to get to a point where you can consistently drop spears on your targets. You will find it easier at first to chase down targets at a reasonably close range, with long-range aptitude to come over time. That's the end of the first edition of our Realm Royale Mage guide. As we play the game more and learn more about playing this class, we'll add in all of our latest tips and insight.